MANILA, Philippines – With 38 more days to go before the National Elections, everyone is so busy now in dissecting every achievement and demeanor of all politicians who wish to be seated in the government. Surveys play a vital role in helping the citizens in decision making, on who they will root for during the election day. Social Weather Stations (SWS) and Pulse Asia are just two of the well-known survey firms which conduct nationwide poll together with the major TV stations, broadsheets and leading websites in the country. But, a brilliant idea initiated by the marketing department of a popular convenience store is now making noise in the archipelago in echoing the voice of the entire nation when it comes to its presidential bet. 7-eleven for the 2nd time re-launched its “7-election: The voice of the GULP generation” local survey campaign. The mechanics is super simple, just visit any of its stores, purchase its signature drink, the “Gulp” and pick the cup of your choice with the image and name of your presidential aspirant. The staff will then record your preference and send the data to their website: http://www.7-election.com.ph/. On the website, a countdown timer to the national election is highlighted along with almost real-time survey results collated from the store chain’s 1,600 outlets all over the Philippines. As of publishing time, Davao City Mayor Rody Duterte leads the poll with 58% of total votes followed Senator Grace Poe with 11%, Senator Miriam Defensor-Santiago and Vice President Jejomar Binay tied at 3rd place with 6% and last and yes the least, DILG Secretary Mar Roxas with 4%. The remaining 14% went to the “Nuisance Cup” which is dedicated to customers who are still undecided on who they will vote for or for folks who don’t really care about politics at all. 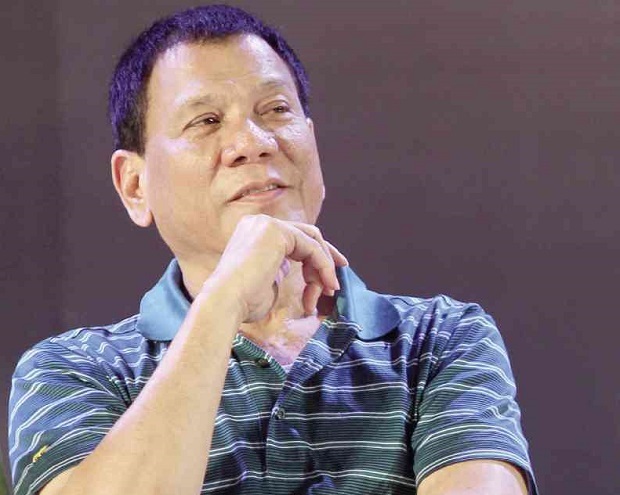 Mayor Duterte enjoys the huge margin of lead versus the 4 other presidential candidates. We’ve checked the stats in each and every turf of the Presidential Candidates and it’s really amazing to know that Duterte cemented his top post. In Davao Region XI the fierce Mayor got 89% of votes. In Makati, the Binay territory, Digong is seating pretty over Jojo Binay with 56% while the Vice President garnered only 10%. In Pangasinan, where FPJ was loved by everyone and her daughter Grace Poe claims the same. Duterte Harry took the half of the pie leaving the Senator with only 17%. While in Western Visayas, the origin of Secretary Mar Roxas’ family and hometown of Senator Miriam Defensor - Santiago, Mayor Rody still dominated them with 48% compared to the 10% of Roxas and 9% of Santiago. Although, possessing an ample and comfortable lead, Duterte is still not a sure win. The survey result is just a small chunk of the entire population and still far from over. Of course, this survey is non-bearing and doesn’t recognized by the Commission on Elections (COMELEC). And for sure, the presidentiables will just shrug this off especially the bottom four. 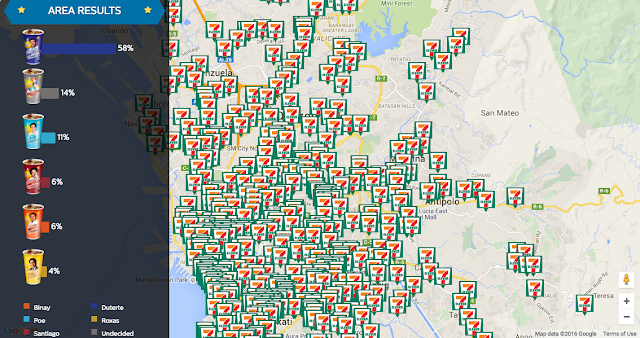 On May 9th, the election day, 7-eleven will release the final result.